"......the longest high voltage electric transmission line in the word carried hydroelectric power to the NWP's huge powerhouse at Alto........the alternating current signal and track circuit, essential to subway operations, was pioneered on the North Shore (NWP)........"
Ferryboat/electric commuter train service (as noted here earlier) ended in 1941;mainline NWP passenger trains (with bus connections) lasted a while longer. Until 1939, the SP's "Red Electrics" and the Key System's MU's connected with commuter ferries at their respective pier terminals; in that same year, trains of both companies began operating via the Bay Bridge's lower level, to the new Transbay Terminal. Until the NWP's total electric commuter service abandonment in 1941, double-ended passenger ferries* also operated out of Sausalito. Like their New York Harbor counterparts, these huge vessels could load and unload passengers from both the upper and lower decks; however, unlike the New York ferries, the upper level loading aprons at terminals met the boat's upper decks from opposite sides (port and starboard) instead of the aprons lowering to the upper deck in the more traditional New York manner. At the SP's OAKLAND MOLE terminal, as an example, the lower apron off the bow led main line passengers into the mainline portion in the terminal, whereas the upper (and lower) aprons on both sides led to the "Red Electric" commuter trains. *The "EUREKA" is the last surviving NWP boat, and is on exhibit today, and open to tourists. When the NWP abandoned electric commuter service in 1941, she went over to the SP, where she operated well into the 1950's. 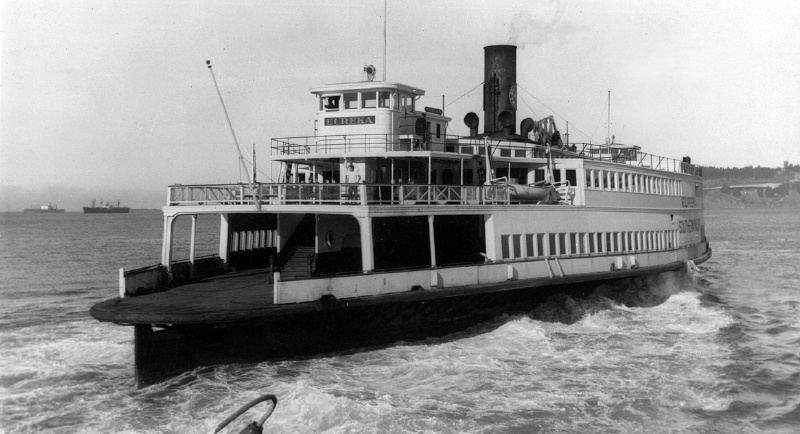 She was also the last "walking beam" engine ferryboat to operate on the Bay.